Do you remember the toilet scene in Jurassic Park? The one where scientist guy sitting on the toilet gets destroyed by the TREX? Well I’ve been thinking a lot lately about how people’s investments get T Rexed when they get tangled up in high fee mutual funds. What got me starting to think about it was my friend. Anyways, my buddy is a smart guy. He’s a CRAZY hard worker, super handy, and to boot, he’s very frugal. The other day I was at his place helping him put an alternator in my vehicle and we got talking about money. 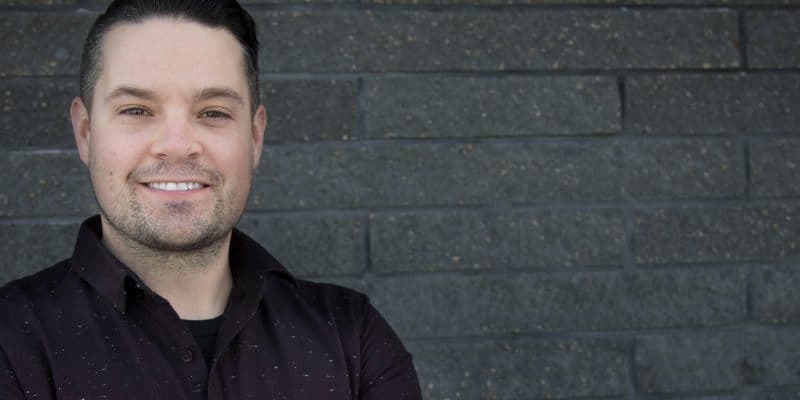 I’m teaching a money course at my church in a few weeks and I wanted to find out from him, a smart, industrious, frugal father of 3, what he’d like to know more about when it came to money. He said he knew he should be paying more attention to the details of his investments, how they were doing and whether he was on track to meet his goals. The thing he really wanted to avoid was ending up in the same financial situation as his parents. They had invested for many years in mutual funds only to have walked away with very modest returns. Well, I was all over that like a squirrel on nuts. Like white on rice. Like a fat kid in a candy store (I can tell fat jokes because I was fat. I have the pictures to prove it. No I’m not sending them to you.). When it comes to investing, the return on your investment means nothing. What really matters is that amount of your return that you get to KEEP. When I asked how much he was paying, he wasn’t sure. This isn’t uncommon. In fact, one survey revealed that 46% of people didn’t think they were paying ANYTHING for their investments. The truth of the matter is that people are paying TONS for their investments. 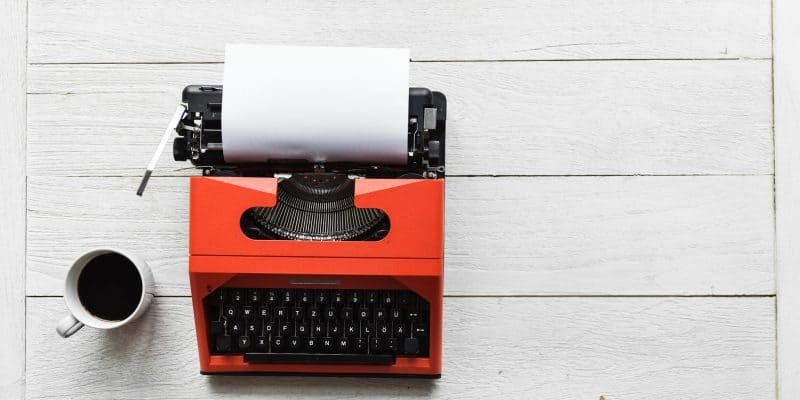 And although the numbers are measured in small percentages, over time, they add up to MASSIVE return-decimating bites into your retirement savings. The problem is, determining how much they eat into your returns involves math. And lots of people hate math. It scares them. They avoid it like a Mountain Dew addict avoids the dentist. Now math is hard at the best of times. I’m not a math guy, and I can empathize with how people are scared and intimidated by math. Sometimes, it just doesn’t seem to make sense. But trust me, the math is correct. Small differences in your investment fees can add up to hundreds of thousands of dollars over a lifetime of investing. I asked my buddy to do a little digging to figure out what he was paying in fees. This information is easy to get your hands on. You can go to the website of whatever bank, brokerage firm, or investment company runs your fund and look it up. It’s often found in a document called a prospectus, fund facts sheet or something similar. Do a quick search and find what’s called the Management Expense Ratio (MER). These are all the expenses associated with the fund expressed as a percentage. It’s this percentage which is deducted from the returns of your investment and used to pay the people who manage the fund and your advisor who recommended it. In short, the MER is how much you’re paying for your money to be invested in that particular fund. After doing a bit of poking around, my buddy told me he was invested in 5 different mutual funds, all in registered accounts. The average MER on these funds was 1.8%. Just for comparison, the average MER of mutual funds is 1.95%. And today there are exchange-traded funds (ETFs) that track the major stock markets which have expenses as low as 0.1, but let’s use a more conservative number of 0.2%. Now on the surface, these differences in the MERs look small. But over time, they can make the T Rex taking out Newman look like a baby eating a cracker (slow, slobbery, and generally not scary at all). Let’s assume both me and my buddy, and someone investing in ETFs starts out with $1000 and contributes $500 each month towards their retirement. They invest for the entirety of their working lives, which we’ll say is 35 years. And, over the course of the 35 years, they average a 7% return. After 35 years, each individual will have contributed $211,000. But my investments, with an MER of 0.5% will be worth $779,220. My buddy’s, on the other hand? That’s a difference of $193,000. Well, the difference in MER is 1.3%. Which means you’re losing 1.3% of growth on your investments. In 1 year, on $1000, that’s $13. It really doesn’t seem like that big of a deal. But it’s not just 1.3% in one year. It’s 1.3% COMPOUNDED over 35 years. So how much is that?? 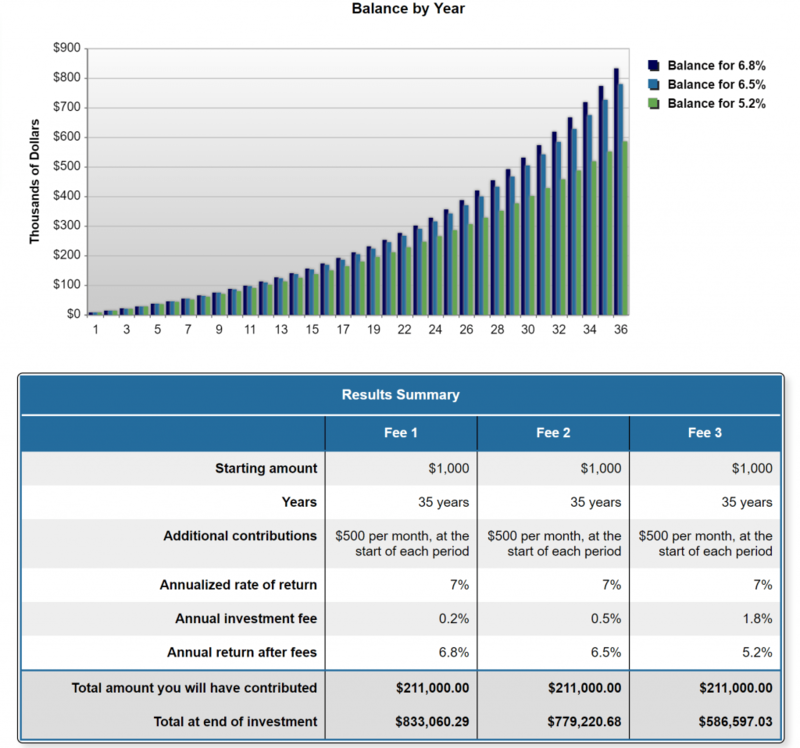 Well in this scenario it means that you’d lose 25% of your returns when compared to a mutual fund with fees of 0.5%. So to recap, when you have a difference in MER of 1.3% (very tiny number), it ends up reducing the value of your investments by 25% (VERY LARGE NUMBER). No matter how you say it, the number is nuts. Einstein described compound interest as the most powerful force in the universe and the greatest mathematical discovery of all time. But any powerful natural force always has two sides to it, a sort of Jekyll and Hyde complex. Just as the force of gravity both prevents us from being flung off the planet as it rotates through space while at the same time sucking us to the earth when we fall out of a tree, compounding can work for us AND against us. It’s awesome…when it’s working in our favor, as it is if you invest early and minimize fees. Small amounts of invested money can turn into millions almost magically over time. But there’s a dark side as well, a sort of tragic magic if you will. Small fees on your investments can compound and devastate your investment returns like a T Rex going off on a Chihuahua. And the most insidious part of the whole thing is that because the fees seem insignificant, they often go ignored. Ignored until you start chatting money with your friends and throwing numbers around of how your portfolios are doing. When you ask what they’re investments have been returning and they say 7%, you look at yours and feel pretty good. You’ve been getting the same. In your mind, everything is even Steven and it’s all good. So you file your investment statements away along with any thoughts that you might be getting hosed. As I mentioned earlier, your returns don’t mean anything. What matters is how much of your returns you get to KEEP. Perhaps the best way to determine that is to figure out your T-REX. No, not the species on Dinosaur responsible for most of the carnage in Jurassic Park (and those pesky raptors). The Total Return Efficiency Index or T-REX. 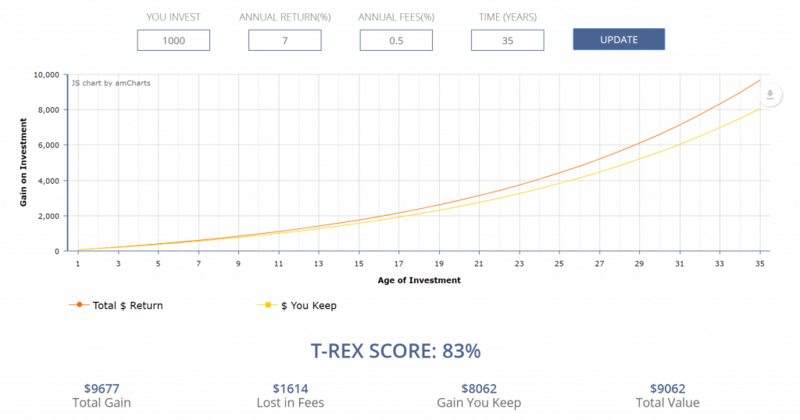 The T-REX score, developed by Larry Bates of The Wealth Game, is a measure of efficiency in regards to how much of your total returns you actually get to keep (otherwise known as your net return). NOTE: Total Return is how much an investment makes including interest, dividends, appreciation, and compounding. Your net return is this number minus fees. Essentially, it’s how much money you go home with after all fees are deducted. 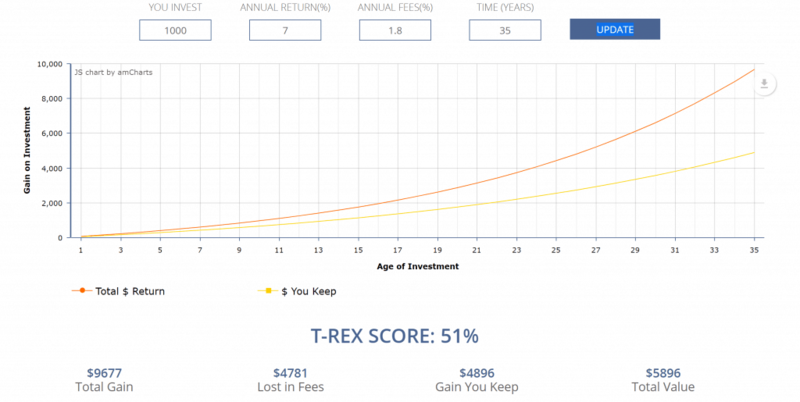 The higher your total fees, the more of your money that gets devoured, and the lower your T-REX score. A score of 100% means you keep all of your total returns (this never happens). A score of 50% means you lose half of your total returns to fees (sadly, this happens more often than most people realize). Now it’s not a perfect calculator. You can see a difference of 32% in this scenario while in the earlier example the difference was 25%. The reason for this discrepancy is that the T-REX score only allows you to use a fixed starting amount and won’t take into consideration you making regular monthly contributions. With all that said, it is a very useful tool for determining the efficiency of your investments and how they compare to other potential products. It also very simply demonstrates the massive impact that a small difference in fees can have on the dollars you actually get to keep. The score is simple and accessible, making it easy to understand for the average person. It’s a score I could chat about with my buddy, and use to explain how his high priced mutual funds are absolutely SHREDDING his investment performance. It’s a number that would not only make sense but would also drive home the harsh realities of high investment fees. There are countless variables outside of your control that can impact your investments. Stock market crashes, management decisions, wars, natural disasters, the list is long and varied. Don’t spend your precious time trying to anticipate how these circumstances will impact your portfolio. Not only does it require a ridiculous amount of time, it’s a fool’s errand. Fees, and it’s the one variable COMPLETELY within your grasp. If I told you that a TREX had escaped from Jurassic Park and was running amok in your neighborhood, you’d do everything you could to protect yourself. Now you know how fees can eat away your future money. How have you minimized fees on your investments? Is financial advice worth the amount you pay? Please share in the comments below or on Twitter @method_money or my Facebook page Method To Your Money. You can also find me on Pinterest. Want more great ideas for mastering your money? Sign up to receive my weekly emails detailing how to keep more of your hard earned cash! Very interesting article. I know the importance of keeping feels low, but have never heard of the T-Rex score. That’s a fun little model to play with. Thanks for teaching me something new! I just found out about the TREX score too. It is pretty cool. I think it’s a nice visual for people who have a hard time with the math of compounding loss because of fees. People understand percentages. The closer you are to 100%, the better the fund! It makes sense! Thanks for taking the time to comment! I really appreciate it!